A £100 non refundable deposit is required to secure and the balance four weeks before the stay. To help us to respond to your enquiry fully please include in your request the number of adults (over 21), number and ages of any children and, if you are looking to have a dog accompany you, the breed. Our centrally heated/double glazed caravan is in the perfect spot on the site for those wishing to enjoy the site’s main street but is also a relatively short stroll from Trecco Bay’s blue flag beach. 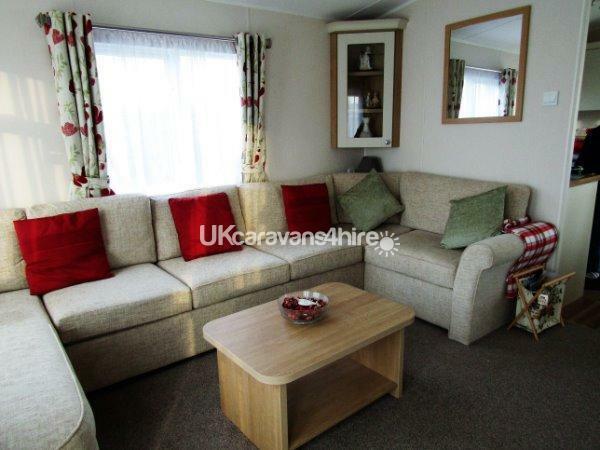 The caravan consists of a spacious master bedroom (with a memory foam mattress), a twin room, a large airy lounge/diner with a pull out double bed and a very well equipped kitchen area with fridge/freezer, microwave, iron & ironing board. The bathroom has a good sized walk in shower, wash handbasin & toilet and there is an ensuite to the master bedroom with a toilet and wash handbasin. As with our other caravans on Greenacres (user id 1399 and 3553) we have a dedicated parking place and piped gas, rather than the unsightly gas bottles. Umlimited gas & electricity are included in the quoted costs. We not only provide the pots & pans, crockery, cutlery etc but also those little extras which can fill your boot such as toilet rolls, kitchen towels, foil, cling film, tea, coffee, sauces, condiments, tissues etc. in fact all you need to bring with you is your towels as the beds will be made up ready for you. You will be greeted on arrival by a welcome bottle of wine (if you do not drink please say and we will provide some soft drinks instead) and a good range of DVDs, games & toys etc will be available for your enjoyment. The TV has a 40” screen linked to a Freesat satellite dish, there is a separate DVD player and even an electric fan for those warmer days. There is also a TV in the master bedroom. A high chair is available on request as are bed sides (the latter does need to be pre-booked as we have only one set between the three caravans). We have decking on the entrance side of the caravan and separately to the double doors at the front of the caravan with outdoor furniture. The gate to the side decking has a lock for added security for younger guests. The site itself has two live entertainment venues (passes are required) and an impressive pool area, which can be accessed with those same passes or on a pay as you go basis. There is also a restaurant, sportsman’s bar (screening live sporting events) as well as having darts, pool table etc. for those who prefer to participate than watch. There is a good range of shops and plenty of entertainment for old & young alike including dodgems, Jungle Jims, Junior 10 pin bowling and penny (no longer!) in the slot machines in separate areas for children and adults. Outdoors there is crazy golf, adventure play & wet play areas and sports areas. Ideally situated between Cardiff & Swansea and only a short distance from Junction 37 of the M4, the site is in easy reach of a wide range or tourist attractions i.e. besides the cities themselves there is the Mumbles Peninsula, Barry Island, Ogmore on Sea, Southerndown & Aberavon on the coast and a short drive inland will give you access to some spectacular Welsh valley & mountain scenery & attractions plus, if you need a shopping “fix”, the Bridgend Outlet Centre is very close. Believe us you will never be short of something to do. Even in walking distance there is a choice of sandy beaches, rock pools to explore, the opportunity to fish from the shoreline, Porthcawl’s long established fairground, Coney Beach offering donkey rides in the peak season, the pretty little village of Newton with a couple of nice pubs serving lunches & evening meals etc. Whereas within just a short drive you would be able to play golf, mountain bike and partake in other more adventurous sports. In the caravan you will find a range of tourist information brochures to give ideas. Although we do ask you to bring your own bedding & towels, if you are flying into the area or are restricted for space, just say and I am sure we will be able to help for a nominal charge. Excluding peak periods e.g. bank & school holidays and during months of June - September, we will be happy to offer short breaks (minimum 3 nights). Prices will be supplied on application. We do request a £100.00 damages bond rest assured, however, that this will be returned to you, if not on the day of your departure, within the week following, providing all is well at the time of you checking out. We do hope that this will not deter you from booking with us. We will accept one small well behaved adult dog. Additional Info: Fishing is from the beach. Passes are required for the live entertainment venues on site . The same passes give access to the Pool, however, the pool may also be used on a pay as you go basis. There is a choice of takeaways, Rock shop & Gift shop. 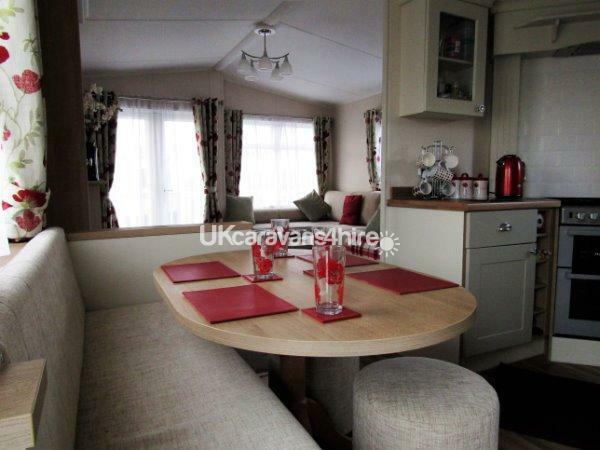 Perfect Caravan, Fantastic Location on the site, Amazing hosts. Cannot fault this caravan, everything was perfect. This was outstanding in every way. There was everything you needed for the start of your holiday. All you needed was to buy your main things for cooking. My dogs appositely loved it. Definitely will be back. Margaret and Fred great hosts. Thank you so much. It was a pleasure having you as guests and we look forward to your return. 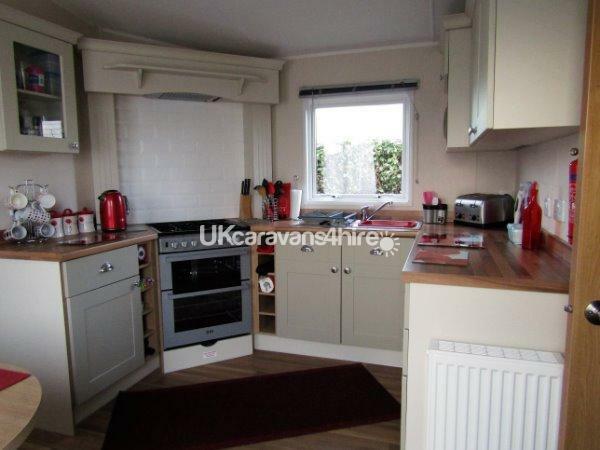 An immaculate well kept caravan. Very homely. Lovely touch of added extras...tea sugar condiments even a bottle of wine on arrival. Puzzles books and games for children was fab. Even a teddy each tucked up in each of children beds which our children (7 & 2) loved. 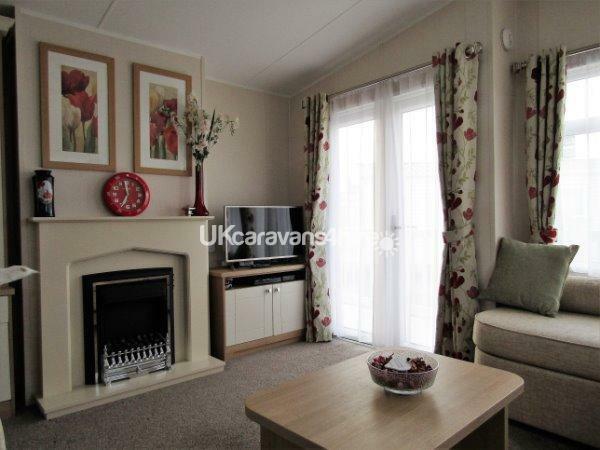 Caravan situated in prime position. holiday park had everything we needed and more. Definitely will be returning. Hi, i have three chldren aged 13,12 and 8 and trecco bay has facilities for all ages. The caravan itself was immaculate with a very good layout with an extra toilet and beds were very comfortable, with pleanty of storage in the main bedroom. There were extra touches with complimentary sweets and little gifts for the kids plus a free bottle of wine. I have never booked a private caravan before and have always gone with parkdean themselves, but from now on i will be sticking with Fred and Margaret and I will defininately be staying again and highly recommend to all. 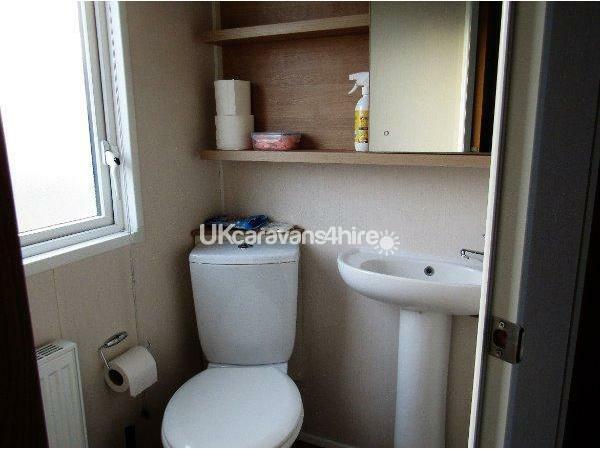 Beautifully clean caravan. Spacious bedroom with very comfortable Kingsized bed and plenty of wardrobe space. Good sized bathroom and shower enclosure. Second toilet was handy too. Very nice to have little extras provided on arrival. Milk, cookies, toilet rolls, fairy liquid. Not to mention kitchen roll, tissues, hair dryer, ironing board with iron. 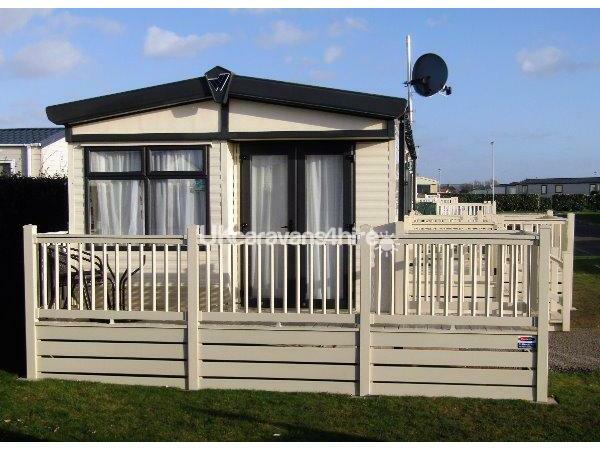 Position of caravan on site is ideal, close to all amenities and the beach. Would highly recommend .